Items in this section are common parts to suit Rayburn models still currently in production. These include bricks and grate parts as well as door handles and flue parts. If you do not see the parts that you require AGA Australia may have them in stock or should be able to order these in from AGA Rayburn in the United Kingdom. Please call us to discuss. Introduced in 1958, the Royal took over as a direct replacement for the Rayburn No 3, with which it shared many of the same features. It was available with or without a hot-water boiler and with left or right handed ovens, also available were optional extras such as the splash back, plate-rack, drip tray and a plinth to raise by the height by 3.75 inches. The standard boiler was plain cast iron, with the option of having it glass lined (enamelled) or of copper construction. In 1968 the option of twin insulating covers were offered, before becoming standard. By 1988, the left-hand oven option was discontinued. The mid 1990's saw more colour options introduced together with chrome plated insulating covers and were re-designated 200S & 212S. Later changes included slam catch oven doors. From 2005 onwards, the flue damper moved to the front of the chamber and a positive catch was added to the fire door. Early in 2006, the model re-designated SFW to emphasise its wood burning capability. The Rayburn Solid fuel Nouvelle was introduced in the mid 1980's, to initiate a new range of central-heating cookers intended for use with a range of solid fuels and also wood and peat. Oil & Gas Nouvelle's were subsequently introduced. Similar to the Rayburn Supreme, the Nouvelle offered wider choice of colour options and chrome insulating covers. It provided cooking together with domestic hot water and heating. It was only produced with ovens on the right hand side. Advantage was taken to quote the boiler output ratings in accordance with the new European Standards, which permitted a 2 hour re-fuelling cycle. Therefore, although the fabricated steel boiler was identical to the Rayburn Supreme model, it was quoted as having the higher maximum output of 16.1kw/hr (coal) 5.9kW/hr for wood. This was achieved by maintaining a high oven temperature and selecting the 'heating' position on the control damper. During summer use when the firebrick positions were changed, the output reduced, with the 'cooking' position of the control damper selected. The boiler temperature was controlled using the water sensing thermostat sited at the rear of top plate. The appliance was fitted to a heating system with the circulating pump on the return pipe before the junction of the return from the indirect cylinder. The domestic hot water is available constantly, while the appliance is alight, by using an open vented gravity feed 190 Litre (40 gallon) cylinder. The pump can be controlled by a programmer and/or room thermostat, and it was recommended that a boiler low temperature return thermostat be fitted. The hotplate had 2 hinged insulating lids, the heat being provided by the hot flue gases passing across the underside. The temperature being regulated by use of the spin wheel, which also altered the oven temperature by allowing more or less air to the fire grate. Available in a wider range of colours, it had a black top-plate. It became re-designated as the 355S during the early 1990'sand later in 1999 it became the 355M to emphasize its Multi fuel capacity. By this time, slam type oven door catches had been added and the lids restyled. From 2005 onwards, the flue damper moved to the front of the chamber. Early in 2006, the model was re-designated SFW to emphasise its wood burning capability. In 2007, two new models were introduced solely for burning wood fuel. The 345W is based on the existing 355 but intended to burn solely wood. The 300W is the first cooking only (dry) Rayburn designed to solely burn wood. 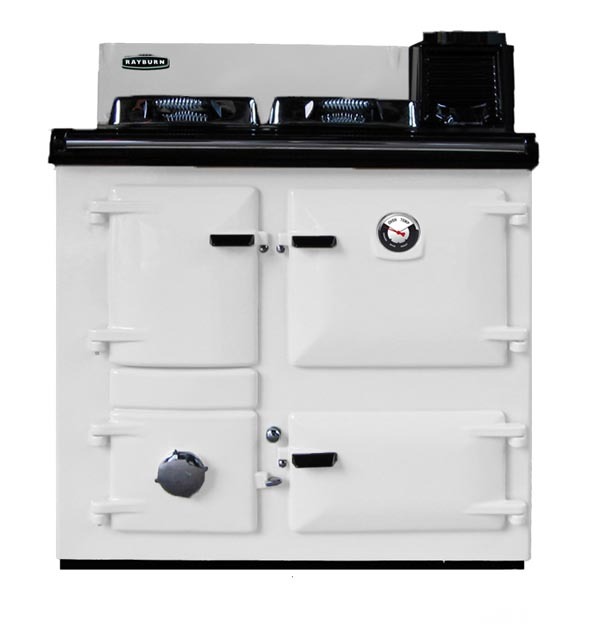 Introduced in 1979, the Rayburn MF was capable of burning a range of solid fuels together with wood and peat. The fabricated steel boiler produced a maximum of 16000 BTU/HR (4.7 KW) to give domestic hot water and heat for approx. 2-3 radiators. The domestic hot water was provided by gravity circulation to an indirect cylinder of 190 Litre (40 gallon) capacity. The circulation pump (usually fitted to the return pipe) could be operated via a programmer and/or room thermostat. It was also recommended that a low temperature clamp on thermostat be fitted to the return connection. Having two ovens, the level of heat was controlled by the position of the spin wheel on the ash-pit door. The higher the oven temperature, the greater the amount of hot water produced. Extra firebricks were provided to place over the boiler surface during summer, to reduce the heat and provide domestic hot water. As well as the normal gloss enamel the MF was also offered in a Matt Black or Brown enamel, the later having 'gold' trims. An optional splash-back was available, and until the mid 80's the appliance was produced in both left hand oven and right hand oven versions. In the mid 1990's it was re-designated the 216M, with additional colour options, chrome lids and slam catch oven doors.